The mesolimbic dopamine (DA) system is considered a principal site for nicotine–cocaine interactions. 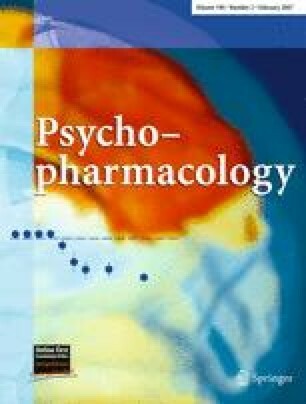 The aim of this paper is to study the effects of local perfusions (through the microdialysis cannula) of nicotinic acetylcholine receptor (nAChR) antagonists in the ventral tegmental area (VTA, where mesolimbic DA cell bodies are located) or nucleus accumbens (nAc, where mesolimbic DA nerve terminals project) on cocaine-elicited increase in DA levels in the nAc of mice using intracerebral microdialysis. Intra-nAc perfusion of mecamylamine (a nonselective central nicotinic antagonist) or coperfusion of methyllycaconitine (MLA, 10 nM) and dihydro-β-erythroidine (DHβE, 10–100 μM) decreased cocaine-elicited increase in DA perfusate levels. In contrast, intra-nAc perfusion of MLA alone (a relatively selective antagonist of α7 subunit-containing nAChRs) increased, while DHβE (a relatively selective antagonist of heteromeric nAChR subtypes) did not alter, cocaine-elicited increase in DA perfusate levels. Intra-VTA perfusion of MLA (100 nM) or DHβE (100 μM) significantly increased the cocaine-elicited increase of DA levels in the nAc or VTA, whereas DHβE and MLA coperfusion or mecamylamine perfusion had no significant effect. These results show that intra-nAc and intra-VTA perfusion of nAChR antagonists differentially affect cocaine-elicited increase in DA levels in a region and subtype-specific manner. This suggests that multiple cholinergic/nicotinic pathways influence the effects of cocaine on mesolimbic DA neurons in complex, and sometimes opposing, patterns. The work was supported by grants from the Italian MIUR (MM05152538) (M.Z.) and grants #DA00436, DA14241 and AA15632 from the National Institutes of Health (M.R.P.). The authors have no financial interest in or financial conflict with the subject matter or materials discussed in the manuscript.